Neil Young and Promise of the Real played a memorable and not-too-polished set at the Spokane Arena Friday. Hoots and hollers come sporadically. If we just call for him, he’ll arrive. But at 7:30 pm, the Friday night show set time, Neil Young still hasn’t appeared on the Spokane Arena stage. Suddenly, darkness. Two people dressed as farmers, complete with overalls, appear front and center. As if in a field, they begin to toss seeds around. Is this a performance art piece? Will Neil Young and Promise of the Real come through the floor of the stage as if grown from the earth? Instead, a lone spotlight switches to the side of the stage where Young sits at an upright piano, partly obscured by speakers. His unmistakable voice rolls into “After the Gold Rush.” It’s stunning. People settle into their seats, beers in hand. For his summer tour with Promise of the Real — which includes Willie Nelson’s sons Lukas and Micah Nelson (the latter normally plays with his band Insects vs Robots) — Young began his shows alone. Last night, the second night of the group’s West Coast tour promoting their new record The Monsanto Years, was no different. In sparse lighting, Young worked through many of the favorites like “Heart of Gold,” “Old Man” and also “Mother Earth (Natural Anthem)” on piano, guitar and even organ. At 69, his voice was strong and glorious as ever. Those high notes, never eluding him. About two-thirds of the venue is curtained off for this show, making it feel far more intimate. While the concert is well attended, the edges of the space still have plenty of seats. The people there are the ones who want to be there. It’s a lot of older men and women, many of whom look an awful lot like Young, but also some younger hipster-type fans. People in hazmat suits storm the stage, shooting dry ice out of devices that must represent pesticide sprayers. Through the mist comes Promise of the Real. 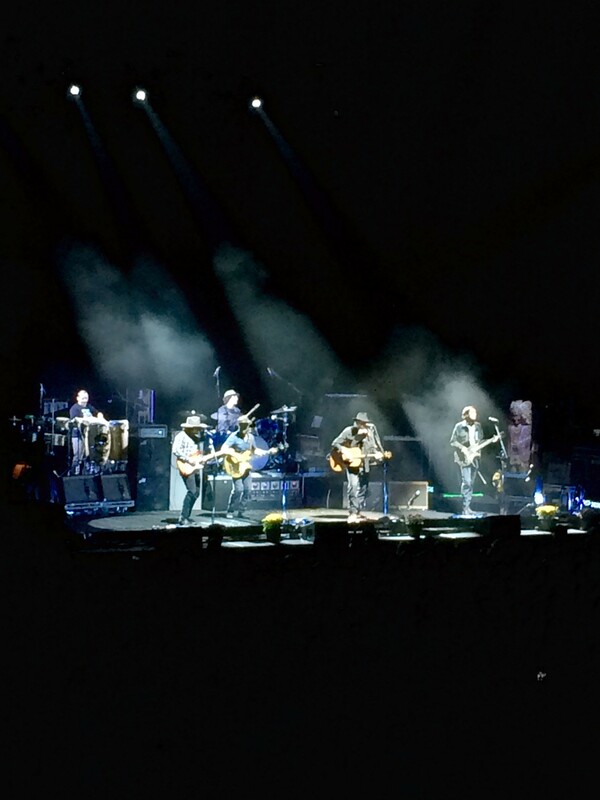 As a full band, they move into more of the classics like “Out on the Weekend” and “Unknown Legend.” The four-part harmony is inspired. “I understand that Spokane is one of the cities to actually sue Monsanto. They needed that,” Young says from the stage, introducing the first song to be played from the new record, “Wolf Moon.” This is the first point in the set when people feel they can go grab more beer, but of all the songs off the new album, this one’s the best. “Hey, wait! This is the right guitar; it just isn’t the right guitar,” says Young to one of his roadies walking away with an acoustic guitar. He needs that one to play the next song. Young then mentions that the "Spokane Daily News" will probably write about his confusion in their review. Next, Young breaks out his electric guitar, progressively building on the set’s loudness. Going back to Harvest, “Alabama” is a particular crowd-pleaser. Things are warming up on stage, so he strips of his jacket, prompting the rest of the band to lose some of their clothes, too. But perhaps he shouldn’t have taken off his jacket. The air is on in the arena. As he puts his coat back on, he admits that the "Spokane Daily News" will most likely make fun of the fact he’s becoming a crotchety old man who is easily chilled. More songs about Monsanto. Starbucks is evil. Monsanto is evil. Safeway is evil. They play five more tracks from the new record. Young never has shied away from his social and political causes, we knew that going in. These lyrics bring a lot of cheers. The final selection moves into “Love and Only Love,” which ebbs and flows between jamming and playing. Young’s guitar riffs sound exactly like his voice: confident, strong with a warbly vibrato. It’s complemented nicely by Lukas’ more lyrical solo playing. The two go back and forth. By the end the band is making music in a tight circle. The guys follow Young through the 15 final strummed chords. They seem honored and excited to be there, smiles all around.